prohibition amendment went into effect in 1920, designed to accomplish a social reform. Four years later, without any appreciable change in the general temper of the country, another social reform was sought in the submission to the States of an amendment making it possible for Congress to restrict child labor. There was far more public sentiment for restricting child labor than for eliminating liquor. In a general plebiscite prohibition could have hoped to win only by a narrow majority, if at all. On the other hand, general opinion was clearly behind restricting child labor. Congress had twice passed laws with that intention, and there was widespread disappointment when in each case they were declared unconstitutional by the Supreme Court. The chief opposition to curtailing child labor came from a numerically insignificant but politically powerful group of employers who wished to exploit children for purely selfish purposes because they were the cheapest kind of human help. Yet in spite of a national sentiment against child labor, the constitutional amendment languished. The general public was too much occupied with automobiles and movies, while small, aggressive lobbies of manufacturers had their way with legislatures. From 1924 to 1932, inclusive, only Arizona, Arkansas, California, Colorado, Montana, and Wisconsin ratified the amendment, while it was rejected by one or both of the legislative branches of thirty-four States. In other State the amendment perished in early processes of legislation or was never considered. The child-labor amendment did not suffer because of dissatisfaction with prohibition. Sentiment against prohibition had not crystallized decisively a decade ago, when most of the State legislatures passed on child labor, nor was there any general attempt then to couple the two amendments. It has remained for President Butler of Columbia University to do that–without justification, we think–in a recent statement. 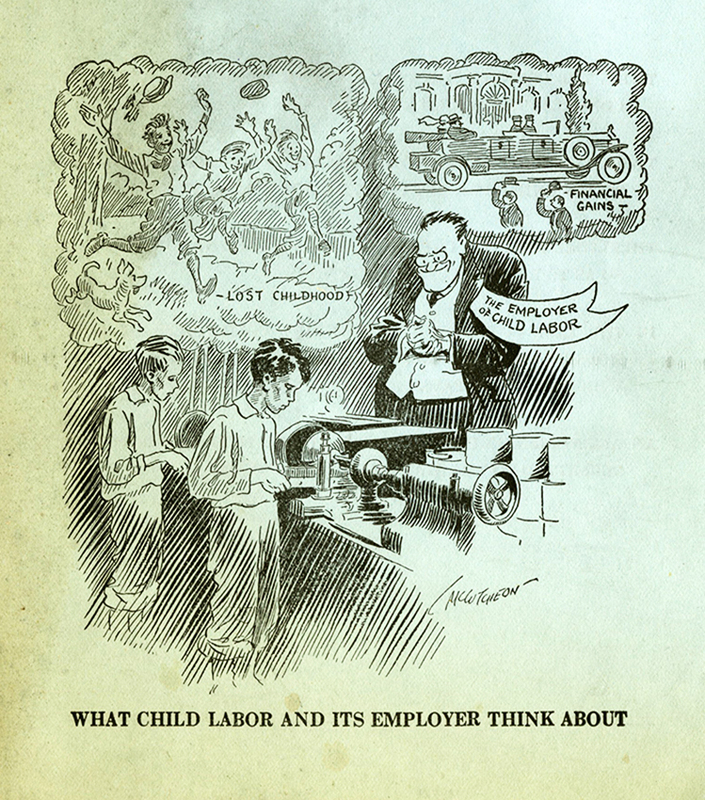 At the end of the year 1932 it looked as if the child-labor amendment had failed. Yet in 1933, when the public turned violently against prohibition and cast it out, there was a sudden and favorable revival of interest in the child-labor amendment. Fourteen States ratified it, in eleven of which it had previously been rejected by one or both houses of the legislature. Thus twenty States have now approved the measure, and favorable action is expected shortly in several more, notably New York and Massachusetts. Doubtless the industrial depression was a powerful influence both in turning the public against prohibition of liquor and in making it more aggressively in favor of limiting the exploitation of children’s toil. When there is not work enough for adult men and women, it becomes obvious that to injure the coming generation by premature employment is not only inhuman but economically crazy. The Nation feels that the changed public sentiment both in regard to liquor and child labor is sound. President Butler’s attempt to discredit the child-labor amendment along with that against liquor on the ground that both constitute federal interference with local government and the family is an argument which, if accepted, would block all effort toward social legislation on a national scale in this country. Prohibition was resented not because it was federal rather than local action, but because it was a restriction which people in general did not want. President Butler’s other ground of opposition–that a legislature having once rejected a constitutional amendment cannot reverse itself–is a legalistic point which must be left to the Supreme Court. Even in case of an adverse ruling, it would be possible to submit and obtain the ratification of a new amendment of precisely the same sort. Some persons have felt that with the prohibitions against child labor in the NRA codes a constitutional amendment is needless, but the coda expire in 1935 and even if they are renewed, it is desirable to give Congress permanent power to deal with the question. The particular reason that it seems necessary to deal with child labor federally rather than through legislation by States is the existence of economic rivalries among the latter. Probably the people of New England would be glad to stop grinding up children’s lives in their factories if it were not for losing their textile business to the South. Likewise the South would not willingly countenance child labor except for the hope of profit in the establishment of new industry. The number of children under sixteen years of age in the textile industry of the United States decreased 59 per cent between 1920 and 1930, but in the same period the number of children in the textile mills of South Carolina and Georgia increased 24 and 12 per cent, respectively. It cannot be too strongly emphasized that the child-labor measure, unlike the liquor amendment, is permissive, not mandatory. The child-labor amendment does nothing of itself at all. It merely gives Congress the authority to “limit, regulate, and prohibit” the labor of persons under eighteen years of age, a power which undoubtedly would be exercised in conformity with popular demand. We hope the measure will be ratified by the necessary thirty-six States.